Observations using the Atacama Large Millimeter/submillimeter Array (ALMA) have revealed an unexpected spiral structure in the material around the old star R Sculptoris in this space wallpaper. This feature has never been seen before and is probably caused by a hidden companion star orbiting the star. 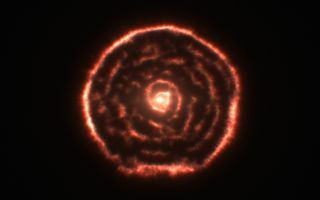 This slice through the new ALMA data reveals the shell around the star, which shows up as the outer circular ring, as well as a very clear spiral structure in the inner material.